Dental implants are one of the most effective and long lasting dental procedures available. 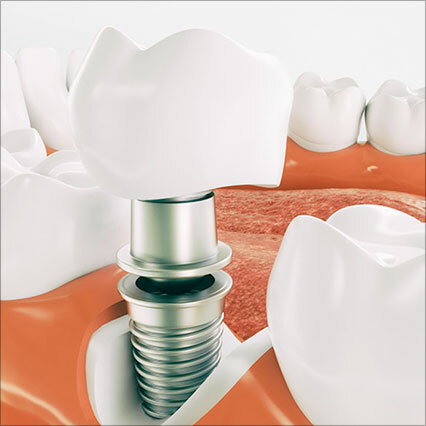 A dental implant acts as a metal root and is placed into your jaw bone where your natural tooth is missing. Then, a beautiful and natural-looking crown is placed on the implant, finishing the process. No other tooth replacement method will function as well as or look as natural as a dental implant. With predictable results and better than 95% success, they're life-changing and a truly permanent replacement! At River Towne Dental, we have built an amazing relationship with and exclusively use Nobel Biocare implant products. This means that we are proud to offer our patients a life time and worldwide guarantee on all our implant placements. This gives our patients piece of mind knowing that their investment is protected anywhere in the world for their entire life. Now that is a powerful guarantee!